Seth and I have had a passion for beads almost our entire lives. Beads of all kinds from all over the world. It was a natural for us to add an extensive bead collection into the equation when we started to formulate what we wished to showcase in our store. The Woodstock/hippie phenomenon certainly included art music and crafts. What would the 60’s be without love beads. Our interest spurred us on and we not only collected beads for our store from every corner of the world and type but to make beads of our own. We have become lamp workers and have and have slaved over our torches to produce hand blown beads for Woodstock Trading Company. The key words for pink are love, passion, romance, purity, kindness, power, tolerance, compassion courage, loyalty, faithfulness, happiness, protection and softness. My thoughts today have turned to spring colors and one of the most interesting colors to use in the torch is pink. One of the major colorant for pink glass is erbium for light transparent pinks. Neodymium can be used for purple pinks. The most famous is the use of Gold in glass to produce that cranberry pink called “gold ruby” However they are hard to use in the flame and must be heated very gently or they “pop” Seth who usually sits to my left when we blow glass can tell you, mom has not patience and very often sends particles of beautiful pink glass every which way. The meaning of the color pink (4th chakra) and an air element is the universal color of love. Emotional love of self and others, It is a color of friendship, affection, harmony and inner peace. We have brought in a large supply of natural stones both polished and rough for wire wrapping or other uses. 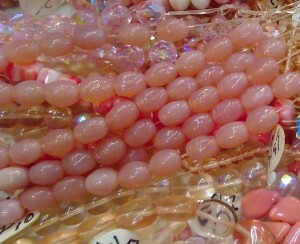 Pink stones are calming, soothing, relaxing. They attract increases in love for yourself, family and friends. Pink stones include pink agate, rhodochrosite, pink tourmaline, rose quartz, rhodonite. Hey Now! Jim from Woodstock here. Today, we have something special. Everyone has been getting in on the blogs as of late. Now we have someone else who would like to say a hello and give his input. That someone is Dr. Harvey Glass, or Doc, as we call him. Doc is Mom’s husband and our shipping department/bead department. He has written a little something for all of you today. It is kind of an invite to everyone. So sit back, relax, and enjoy the wise words of Doc. “The allure of beads is universal. In keeping with that, Woodstock Trading Company has collected many exotic and unusual beads from far and wide. Come look and see our bone, stone, glass, metal, and ceramic ‘eye candy’. Ladies and gentlemen, that was the words of the famous Doc. The man loves the beads and wants to share them with the world. We have some great stuff at Woodstock. Some of the beads are older than the store. The biggest issue is that the beads are difficult to sell online. We are working on a way for everyone to get them. In the mean time, you can only get them in store. We will let you know when these great beads will be available online.